Proprietary Name: Verapamil Hydrochloride What is the Proprietary Name? Non-Proprietary Name: Verapamil Hydrochloride What is the Non-Proprietary Name? Verapamil Hydrochloride with NDC 42571-313 is a a human prescription drug product labeled by Micro Labs Limited. 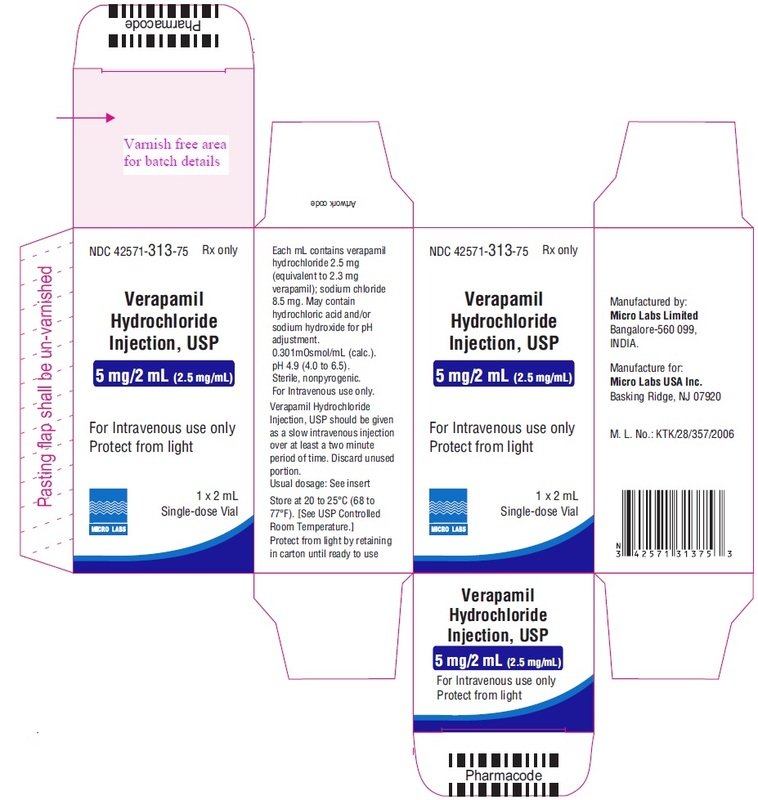 The generic name of Verapamil Hydrochloride is verapamil hydrochloride. The product's dosage form is injection and is administered via intravenous form. FDA Application Number: ANDA211370 What is the FDA Application Number? Verapamil HCl USP is an almost white, crystalline powder practically free of odor, with a bitter taste. It is soluble in water, chloroform and methanol. Verapamil HCl is not chemically related to other antiarrhythmic drugs. Mechanism of Action: Verapamil inhibits the calcium ion (and possibly sodium ion) influx through slow channels into conductile and contractile myocardial cells and vascular smooth muscle cells. The antiarrhythmic effect of verapamil appears to be due to its effect on the slow channel in cells of the cardiac conduction system. The vasodilatory effect of verapamil appears to be due to its effect on blockade of calcium channels as well as α receptors. In the isolated rabbit heart, concentrations of verapamil that markedly affect SA nodal fibers or fibers in the upper and middle regions of the AV node have very little effect on fibers in the lower AV node (NH region) and no effect on atrial action potentials or His bundle fibers.Electrical activity in the SA and AV nodes depends, to a large degree, upon calcium influx through the slow channel. By inhibiting this influx, verapamil slows AV conduction and prolongs the effective refractory period within the AV node in a rate-related manner. This effect results in a reduction of the ventricular rate in patients with atrial flutter and/or atrial fibrillation and a rapid ventricular response.By interrupting re-entry at the AV node, verapamil can restore normal sinus rhythm in patients with paroxysmal supraventricular tachycardias (PSVT), including PSVT associated with Wolff-Parkinson- White syndrome.Verapamil does not induce peripheral arterial spasm.Verapamil has a local anesthetic action that is 1.6 times that of procaine on an equimolar basis. It is not known whether this action is important at the doses used in man.Verapamil does not alter total serum calcium levels.Hemodynamics: Verapamil reduces afterload and myocardial contractility. The commonly used intravenous doses of 5 to 10 mg verapamil hydrochloride produce transient, usually asymptomatic, reduction in normal systemic arterial pressure, systemic vascular resistance and contractility; left ventricular filling pressure is slightly increased. In most patients, including those with organic cardiac disease, the negative inotropic action of verapamil is countered by reduction of afterload, and cardiac index is usually not reduced. However, in patients with moderately severe to severe cardiac dysfunction (pulmonary wedge pressure above 20 mm Hg, ejection fraction less than 30%), acute worsening of heart failure may be seen. Peak therapeutic effects occur within 3 to 5 minutes after a bolus injection. Pharmacokinetics: Intravenously administered verapamil hydrochloride has been shown to be rapidly metabolized. Following intravenous infusion in man, verapamil is eliminated bi-exponentially, with a rapid early distribution phase (half-life about 4 minutes) and a slower terminal elimination phase (half- life 2 to 5 hours). In healthy men, orally administered verapamil hydrochloride undergoes extensive metabolism in the liver, with 12 metabolites having been identified, most in only trace amounts. The major metabolites have been identified as various N- and O-dealkylated products of verapamil. Approximately 70% of an administered dose is excreted in the urine and 16% more in the feces within 5 days. About 3% to 4% is excreted as unchanged drug. Aging may affect the pharmacokinetics of verapamil given to hypertensive patients. Elimination half-life may be prolonged in the elderly. 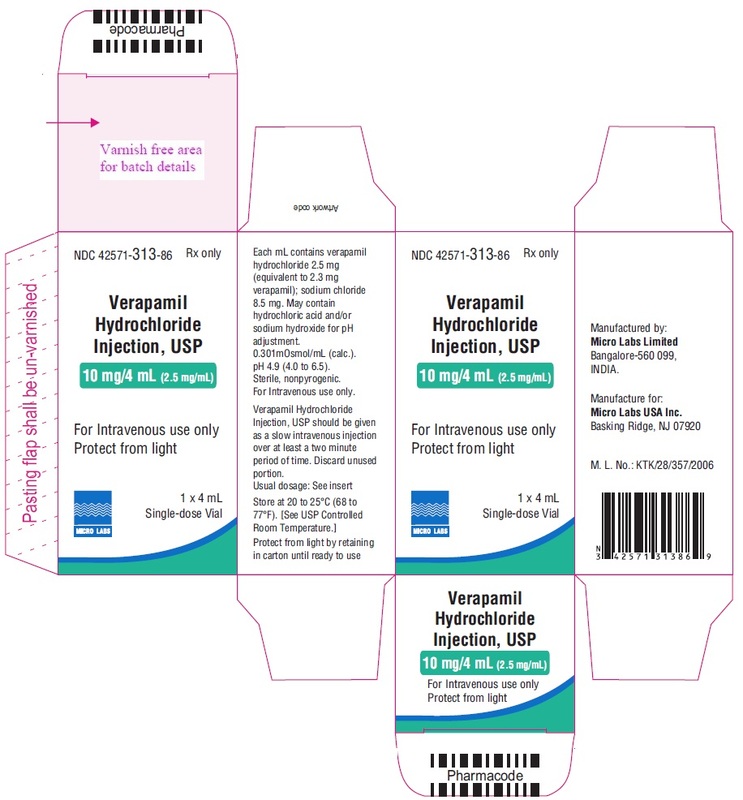 Contraindications And Warnings), the initial use of intravenous verapamil hydrochloride injection should, if possible, be in a treatment setting with monitoring and resuscitation facilities, including DC-cardioversion capability (see Suggested Treatment of Acute Cardiovascular Adverse Reactions). As familiarity with the patient's response is gained, use in an office setting may be acceptable. Cardioversion has been used safely and effectively after intravenous verapamil hydrochloride injection. Intravenous beta-adrenergic blocking drugs (e.g., propranolol). Intravenous beta-adrenergic blocking drugs should not be administered in close proximity to each other (within a few hours), since both may have a depressant effect on myocardial contractility and AV conduction. Patients with atrial flutter or atrial fibrillation and an accessory bypass tract (e.g., Wolff- Parkinson-White, Lown-Ganong-Levine syndromes) are at risk to develop ventricular tachyarrhythmia including ventricular fibrillation if verapamil is administered. Therefore, the use of verapamil in these patients is contraindicated.Ventricular Tachycardia: Administration of intravenous verapamil to patients with wide-complex ventricular tachycardia (QRS ≥ 0.12 sec) can result in marked hemodynamic deterioration and ventricular fibrillation. Proper pre-therapy diagnosis and differentiation from wide-complex supraventricular tachycardia is imperative in the emergency room setting.Known hypersensitivity to verapamil hydrochloride. Hypotension: Verapamil hydrochloride injection (intravenous) often produces a decrease in blood pressure below baseline levels that is usually transient and asymptomatic but may result in dizziness. Systolic pressure less than 90 mmHg and/or diastolic pressure less than 60 mmHg was seen in 5% to 10% of patients in controlled U.S. trials in supraventricular tachycardia and in about 10% of the patients with atrial flutter/fibrillation. The incidence of symptomatic hypotension observed in studies conducted in the U.S. was approximately 1.5%. Three of the five symptomatic patients required intravenous pharmacologic treatment (norepinephrine bitartrate, metaraminol bitartrate, or 10% calcium gluconate). All recovered without sequelae. Heart Failure: When heart failure is not severe or rate related, it should be controlled with digitalis glycosides and diuretics, as appropriate, before verapamil is used. In patients with moderately severe to severe cardiac dysfunction (pulmonary wedge pressure above 20 mmHg, ejection fraction less than 30%), acute worsening of heart failure may be seen. verapamil has been used concomitantly with digitalis preparations without the occurrence of serious adverse effects. However, since both drugs slow AV conduction, patients should be monitored for AV block or excessive bradycardia. verapamil has been administered to a small number of patients receiving oral procainamide without the occurrence of serious adverse effects. verapamil has been administered to a small number of patients receiving oral quinidine without the occurrence of serious adverse effects. However, three patients have been described in whom the combination resulted in an exaggerated hypotensive response presumably from the combined ability of both drugs to antagonize the effects of catecholamines on α-adrenergic receptors. Caution should therefore be used when employing this combination of drugs. intravenous verapamil has resulted in serious adverse reactions (see Contraindications), especially in patients with severe cardiomyopathy, congestive heart failure, or recent myocardial infarction. Disopyramide: Until data on possible interactions between verapamil and all forms of disopyramide phosphate are obtained, disopyramide should not be administered within 48 hours before or 24 hours after verapamil administration. Flecainide: A study in healthy volunteers showed that the concomitant administration of flecainide and verapamil may have additive effects reducing myocardial contractility, prolonging AV conduction, and prolonging repolarization. Hepatic and Renal Failure: Significant hepatic and renal failure should not increase the effects of a single intravenous dose of verapamil hydrochloride but may prolong its duration. Repeated injections of intravenous verapamil hydrochloride in such patients may lead to accumulation and an excessive pharmacologic effect of the drug. There is no experience to guide use of multiple doses in such patients, and this generally should be avoided. If repeated injections are essential, blood pressure and PR interval should be closely monitored and smaller repeat doses should be utilized. Verapamil cannot be removed by hemodialysis. Premature Ventricular Contractions: During conversion to normal sinus rhythm, or marked reduction in ventricular rate, a few benign complexes of unusual appearance (sometimes resembling premature ventricular contractions) may be seen after treatment with verapamil hydrochloride. Similar complexes are seen during spontaneous conversion of supraventricular tachycardias, after D.C.-cardioversion and other pharmacologic therapy. These complexes appear to have no clinical significance. verapamil HCl can precipitate respiratory muscle failure in these patients and should, therefore, be used with caution. verapamil HCl has been seen to increase intracranial pressure in patients with supratentorial tumors at the time of anesthesia induction. Caution should be taken and appropriate monitoring performed. intravenous verapamil, serious adverse effects have occurred. Concomitant use of verapamil hydrochloride with β-adrenergic blockers may result in an exaggerated hypotensive response. Such an effect was observed in one study, following the concomitant administration of verapamil and prazosin. It may be necessary to decrease the dose of verapamil and/or dose of the neuromuscular blocking agent when the drugs are used concomitantly. As verapamil is highly bound to plasma proteins, it should be administered with caution to patients receiving other highly protein-bound drugs. Dantrolene: Two animal studies suggest concomitant intravenous use of verapamil and dantrolene sodium may result in cardiovascular collapse. There has been one report of hyperkalemia and myocardial depression following the coadministration of oral verapamil and intravenous dantrolene. Pregnancy Category C. Reproduction studies have been performed in rabbits and rats at oral verapamil doses up to 1.5 (15 mg/kg/day) and 6 (60 mg/kg/day) times the human oral daily dose, respectively, and have revealed no evidence of teratogenicity. In the rat, this multiple of the human dose was embryocidal and retarded fetal growth and development, probably because of adverse maternal effects reflected in reduced weight gains of the dams. This oral dose has also been shown to cause hypotension in rats. There are, however, no adequate and well-controlled studies in pregnant women. Because animal reproduction studies are not always predictive of human response, this drug should be used during pregnancy only if clearly needed. verapamil HCl in Europe in the treatment of cardiac side effects of beta-adrenergic agonist agents used to treat premature labor. Verapamil crosses the placental barrier and can be detected in umbilical vein blood at delivery. Also, verapamil is excreted in human milk. Because of the potential for adverse reactions in nursing infants from verapamil, nursing should be discontinued while verapamil is administered. Controlled studies with verapamil have not been conducted in pediatric patients, but uncontrolled experience with intravenous administration in more than 250 patients, about half under 12 months of age and about 25% newborn, indicates that results of treatment are similar to those in adults. In rare instances, however, severe hemodynamic side effects − some of them fatal − have occurred following the intravenous administration of verapamil to neonates and infants. Caution should therefore be used when administering verapamil to this group of pediatric patients. The most commonly used single doses in patients up to 12 months of age have ranged from 0.1 to 0.2 mg/kg of body weight, while in patients aged 1 to 15 years, the most commonly used single doses ranged from 0.1 to 0.3 mg/kg of body weight. Most of the patients received the lower dose of 0.1 mg/kg once, but in some cases, the dose was repeated once or twice every 10 to 30 minutes. Cardiovascular: Symptomatic hypotension (1.5%); bradycardia (1.2%); severe tachycardia (1.0%). The worldwide experience in open clinical trials in more than 7,900 patients was similar. Central Nervous System Effects: Dizziness (1.2%); headache (1.2%). Occasional cases of seizures during verapamil injection have been reported. In rare cases of hypersensitive patients, broncho/laryngeal spasm accompanied by itch and urticaria has been reported.The following reactions have been reported at low frequency: emotional depression, rotary nystagmus, sleepiness, vertigo, muscle fatigue, diaphoresis, and respiratory failure.Suggested Treatment of Acute Cardiovascular Adverse Reactions*The frequency of these adverse reactions was quite low, and experience with their treatment has been limited. *Actual treatment and dosage should depend on the severity of the clinical situation and the judgment and experience of the treating physician.To report SUSPECTED ADVERSE REACTIONS, contact Micro Labs USA Inc. at 1-855-839-8195 or FDA at 1-800-FDA-1088 or www.fda.gov/medwatch. Treatment of overdosage should be supportive and individualized. Beta-adrenergic stimulation and/or parenteral administration of calcium solutions may increase calcium ion flux across the slow channel, and have been effectively used in treatment of deliberate overdosage with oral verapamil hydrochloride. Verapamil cannot be removed by hemodialysis. Clinically significant hypotensive reactions or high-degree AV block should be treated with vasopressor agents or cardiac pacing, respectively. Asystole should be handled by the usual measures including isoproterenol hydrochloride, other vasopressor agents, or cardiopulmonary resuscitation. (See Treatment of Acute Cardiovascular Adverse Reactions). Adult:Initial dose − 5 to 10 mg (0.075 to 0.15 mg/kg body weight) given as an intravenous bolus over at least 2 minutes. Repeat dose − 10 mg (0.15 mg/kg body weight) 30 minutes after the first dose if the initial response is not adequate. An optimal interval for subsequent I.V. doses has not been determined, and should be individualized for each patient. Older patients − The dose should be administered over at least 3 minutes to minimize the risk of untoward drug effects. under continuous ECG monitoring.1 to 15 years: 0.1 to 0.3 mg/kg body weight (usual single dose range: 2 to 5 mg) should be administered as an intravenous bolus over at least 2 minutes. (under continuous ECG monitoring). An optimal interval for subsequent I.V. doses has not been determined, and should be individualized for each patient. 1 to 15 years: 0.1 to 0.3 mg/kg body weight (usual single dose range: 2 to 5 mg) 30 minutes after the first dose if the initial response is not adequate. Do not exceed 10 mg as a single dose. An optimal interval for subsequent I.V. doses has not been determined, and should be individualized for each patient. Note: Parenteral drug products should be inspected visually for particulate matter and discoloration prior to administration, whenever solution and container permit. Use only if solution is clear and vial seal is intact. Unused amount of solution should be discarded immediately following withdrawal of any portion of contents. For stability reasons this product is not recommended for dilution with Sodium Lactate Injection, USP in polyvinyl chloride bags. Verapamil is physically compatible and chemically stable for at least 24 hours at 25°C protected from light in most common large volume parenteral solutions. Admixing verapamil hydrochloride injection with albumin, amphotericin B, hydralazine hydrochloride and trimethoprim with sulfamethoxazole should be avoided. Verapamil hydrochloride injection will precipitate in any solution with a pH above 6.0.